The actual location of La Residencia Luzviminda Pensionne was formerly a convent of the nuns of the Order of Franciscan Sisters of Baybay, Leyte. The year was 1995, when it was purchased the place was totally overhauled, refurbished, and remodelled but still retaining the original layout of the building and the number of rooms. It was a sound investment at that time and subsequently was also for the purpose of having a vacation home in Cebu for the family and close relatives, while in transit going to our home province in Leyte. 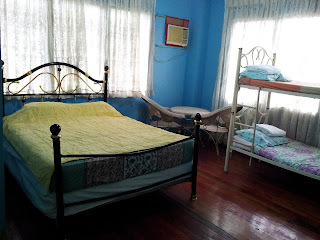 Later on, due to the high demand for residential spaces and need for transient accommodations especially during peak seasons and of the Sinulog Festival every January, the seemingly quaint house was converted to a pension house with ten (10) room accommodation having a range guest capacity of 30 to 40 persons. Our place offers budget friendly standard to deluxe room accommodations located within the heart and vicinity of Cebu City. It is a bed and breakfast type of accommodation that have catered to tourists, transients, guests, and also to students. Our usual day can be best described as very quiet but mixed with the bustling sound of jeepneys and vehicles plying through the road. Our perimeter is well adept and curtained around with high walls and a big entrance gate. Thus our place is very much ideal for persons looking for accommodations that provide secluded yet quiet and comfortable space added with very secure and sound neighborhood. Having difficulty viewing this slideshow? Check out our standard gallery. We are strategically located at the heart of Cebu City and very near to several establishments like: (walking distance to) Southwestern University, Sambag I Brgy. Hall, South Bus Terminal, Cebu City Medical Center, Elizabeth Mall (eMall), Asian College of Technology, and University of San Carlos; (one-jeepney ride to) University of Cebu, University of San Jose Recoletos, University of Visayas, and Cebu Doctor's University; (15 minutes taxi ride going to) Cebu Seaport, Ayala Center Mall, and SM City Cebu Mall; (30 minutes taxi ride going to) Mactan International Airport. Likewise we are located along the main road where taxis and jeepneys are always available 24 hours a day. Today, in partnership with our sister company -- Luzviminda Travel and Tours (www.luzvimindatravelandtours.com), a full service travel agency and consultancy firm that offers complete tour packages in Cebu, Bohol, and Cagayan De Oro, we stand strong and committed to provide and deliver quality and high standard of hospitality services especially in terms of room accommodations and lodging. So come and stay with us... we are "Your Home Away from Home" here in Cebu City. For further information and inquiries, please see our Contact Information. We would love to hear from you. We will get back to you as soon as possible. Copyright © 1995-2012 by La Residencia Luzviminda Pensionne. All Rights Reserved.